This blog post was written by Caleb Njoroge, SNA-K Intern. 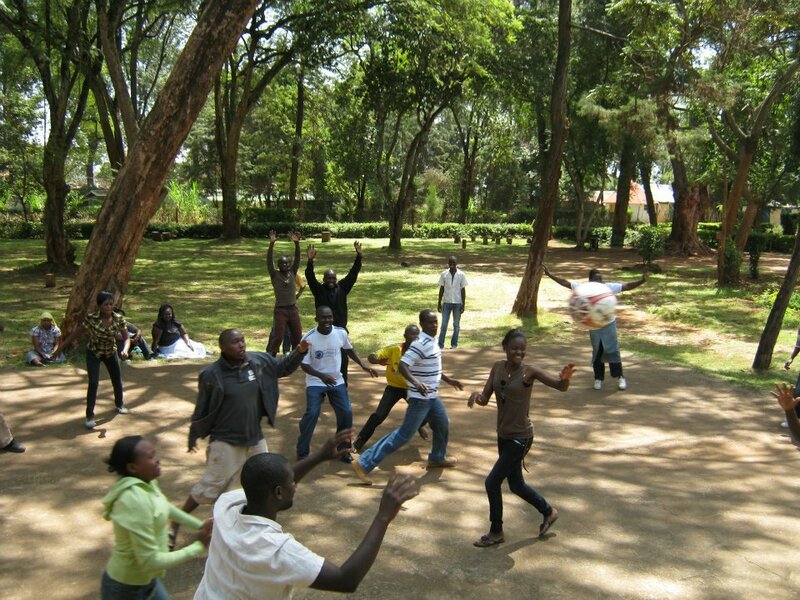 As part of our work with PeaceTxt, and with the support of PopTech, SNA-K has begun the year with two teambuilding exercises: one each in Nairobi and Narok. As we work to scale our outreach and increase community trust of SNA-K, building strong teams of volunteers is crucial. 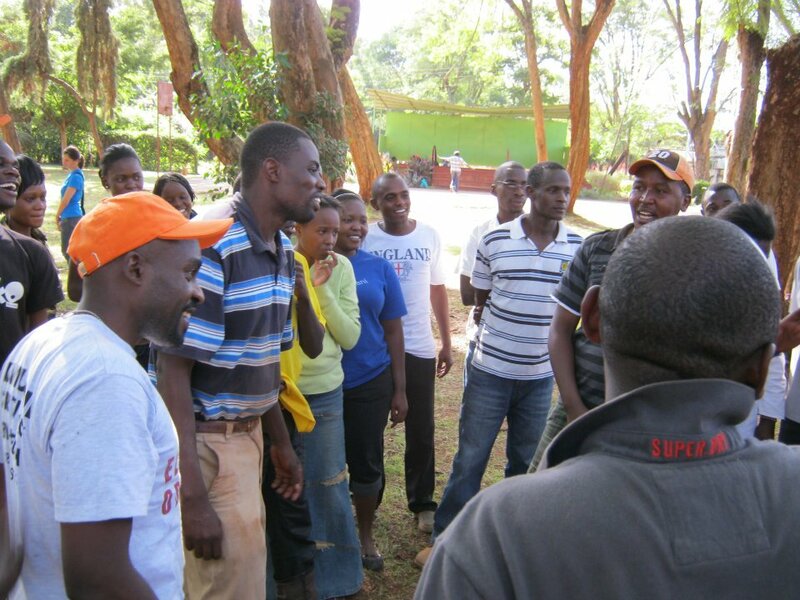 On January 28th, the Nairobi team undertook a teambuilding with at total of 40 participants with the goal of ensuring that the volunteers would be able to know each other well and understand the importance of teamwork in their work with Sisi ni Amani – Kenya. The group met in Baba Dogo at SNA-K’s Kasarani office, and took a bus to Mji wa Furaha, where the teambuilding day was held. The day included getting-to-know-you games as well as an overview of SNA-K, the technology, and our expectations of the volunteers. The day was then facilitated by Nyaga Kamau who has extensive experience with teambuilding, capacity building, and has worked at and sat on boards for organizations in Korogocho for many years. Kamau took the approach of playing games and then facilitating evaluation and discussion of the games to help derive lessons about teamwork. The day began with a game that was a cross between basketball and handball. The group was divided into 4 smaller team, which named themselves Bluetooth, Dush, Eagles and Aquatic. The teams battled it out on the court and the game ended in a tie for all the teams. After the game the group evaluated each team specifically wanting to find out their strengths and weaknesses, opportunities and threats. This made the team members of each team re-evaluate actions that might have caused them to perform poorly. Volunteers then bonded over a refreshment break. The second session was not so different from the 1st one since it involved playing a game and getting a teaching after the game. This was very effective as the members tried as much as possible to work as a team during the games since they knew that they would be evaluated after the game. After lunch the four teams that were made earlier in the day were merged into two teams so that they could play tug of war. 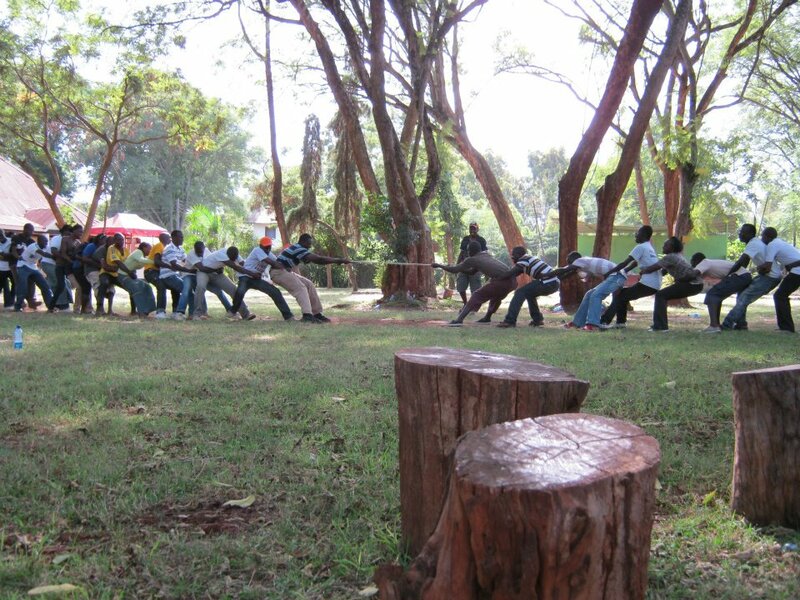 The tug of war marked the end of the teambuilding games as Kamau tried to find from the loosing team what they did wrong and from the winning team what they did right. The members then had chicken as the day came to a successful end. The volunteers were given instructions on the upcoming activities in February, and were excited and happy as they had learnt that for any team or organization to function there must be teamwork. There were several key takeaways from the full group discussions and evaluations throughout the day. Some of the discussion and lessons learned focused on peace as a way of life. There is usually a tendency for people who are working for a peace organization to put differentiation between the work they do and the lifestyle they live. You will find a peace worker getting violent when he is at home or with his friends and when asked how comes he is violent and yet works in a peace organization he will say that when he is at work, then it’s his work/job to be peaceful but when he is at home then there is no work involved there and he can do as he wishes. The message from the teambuilding is that peace should be a way of life it should resonate from home to school to work and to any other place a person relates with other people, it shouldn’t be limited to one place or area. Additionally, there were important lessons about teambuilding. When a rope is being manufactured the more the strands that are woven into it the stronger the rope becomes. This strength doesn’t come easy because the more the strands the harder they have to be woven together to stay as one. This translates into the concept of team work nicely since in a team there are many members that constitute the team and these are like the strands and team members have to communicate, respect each other, carry out their tasks effectively, share victories and failures and this is the weaving of the strands together into a strong cord that can’t easily be cut and that is the essence of teamwork. In a team the members work together and no one criticizes the other: instead, when the team isn’t functioning well the members sit down together to try and solve the problem as a group and not as individuals. Here there is no pointing of fingers or accusations. Instead, there is correction of mistakes so as to enable the members to move on as one. If there is a success in the team, the team once again comes together and analyses the reason for that success and how to maintain that success instead of crediting one individual as the reason of achievement. This motivates the members to know that they are part of the success rather than one individual who might get carried away and think that he/she did it by themselves. Another important thing to note in all effective teams is that, they all are brought together because they share the same passion, and that might be the only thing they have in common since they are from different backgrounds, ages, gender, culture, religion etc. For example, European football teams buy players from Africa, America South America and Europe. These are people who have never met but they all share one common passion: football. They will work together to produce results. No-one coerced them or forced them to be in their teams, they all do it because they each have a passion for football therefore if anyone is in any group, they should be sure that their motivation is based on a passion and drive to achieve the goals set forward by that team. For example, with regards to SNA-K, members should share a passion for peace, and that is the most important reason to be involved.